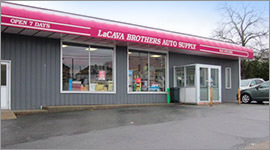 While most people know LaCava Brothers as the best place to go to for auto supply services in Fall River, MA, many don’t realize that we offer valuable professional services as well. Our customers count on us for top quality hydraulic hose services, which can be provided for any type of vehicle or equipment system. They also count on us for rotor turning services, which can be used to save a lot of money on rotor replacement when putting on brand new brakes. In addition to these essential services, we also provide our customers with a few basic FREE services as well. Customers can come into LaCava Brothers for a free battery check or get new windshield wipers installed for free when you buy a pair from our Fall River store. We take pride in being able to go above and beyond our customers’ expectations by offering these important services to the Greater Fall River community. If you have a vehicle or piece of equipment that relies on hydraulic hoses and assemblies, you know how critical it is that everything is in safe and proper working order. At LaCava Brothers, our custom hydraulic hoses provide our customers with the ultimate fluid conveyance system. To meet the growing demands of our clients, we provide a wide range of pressure ranges, abrasion resistance, and all of the hoses that we build are created with long-lasting, high-performance applications in mind. Available seven days a week, our hydraulic hoses can help individuals and commercial clients replace failed or damaged hydraulic hoses quickly to save both time and money. To provide our customers with the best possible results for hydraulic hose services, LaCava Brothers Auto Supply & Services in Fall River, MA only uses the most trusted brand – Gates. Since 1911, Gates has been the leader in hydraulic hoses. The MegaCrimp couplings that we use provide 500 percent better corrosion resistance than any of the other top brands. Your hydraulic system is a key component of your vehicle or equipment. Don’t just trust it to any service provider. Make sure that quality Gates parts are being put on by our team of highly trained and experienced hydraulic hose services providers at LaCava Brothers. Another key component of any vehicle is a quality braking system. 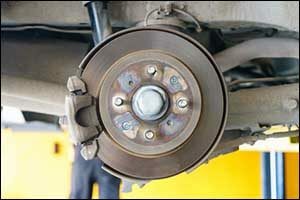 Whenever you replace your brake pads or shoes, it is important to also inspect the rotors or drums. Our team of highly-trained specialists can inspect your rotors for you and determine whether they are a candidate for rotor turning services or if they need to be replaced. It is worth the time it takes to have your rotors inspected to save you money on rotor replacement whenever you do a brake job on your vehicle. Car rotors cost just $16, and truck rotors are just $20 each for turning services. Car drums are $12, and truck drums are $14 each for our turning services. Make sure to give us a call to learn more about how our professional rotor turning services might be able to help you save a bundle when you do your next brake job. While you’re here at the shop, make sure to see our full selection of brake pads and shoes, along with all of the specialty tools you could require to get the job done right. When you come to LaCava Brothers for all of your auto supply and services in Fall River, MA, make sure to take advantage of our free services. Got issues with your battery or want to check and see how it is performing? Just stop by, and we will check your battery to make sure that it is properly charged so that your vehicle is starting up and running as it should. We also do free wiper blade installation any time you purchase a new pair of wiper blades. Our team will even reove and dispose of your old wiper blades before installing the new ones to help save you time and trouble. If you need hydraulic hose services, rotor turning services, or any of our other auto supply and services in Fall River, MA, make sure to visit LaCava Brothers. Our team can help you get your car in tip top shape in no time! Give us a call at 508-676-1951 to speak with one of our friendly agents to learn more about all of the services, parts, products, and accessories that we sell and provide at LaCava Brothers.